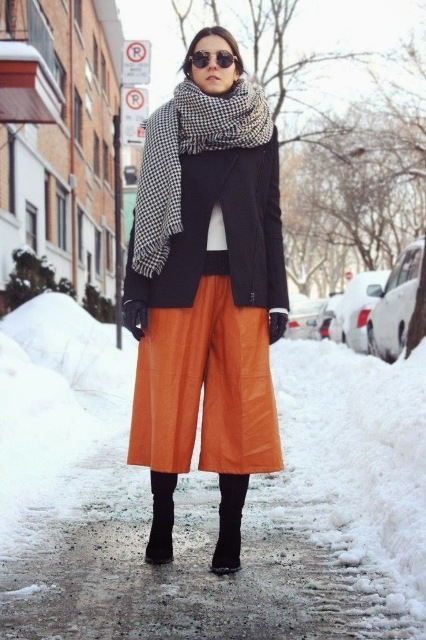 Culottes are still a big fashion trend right now, so you can boldly add them to your fall and winter outfits. I should also mention that they aren’t so difficult to combine as you might think. 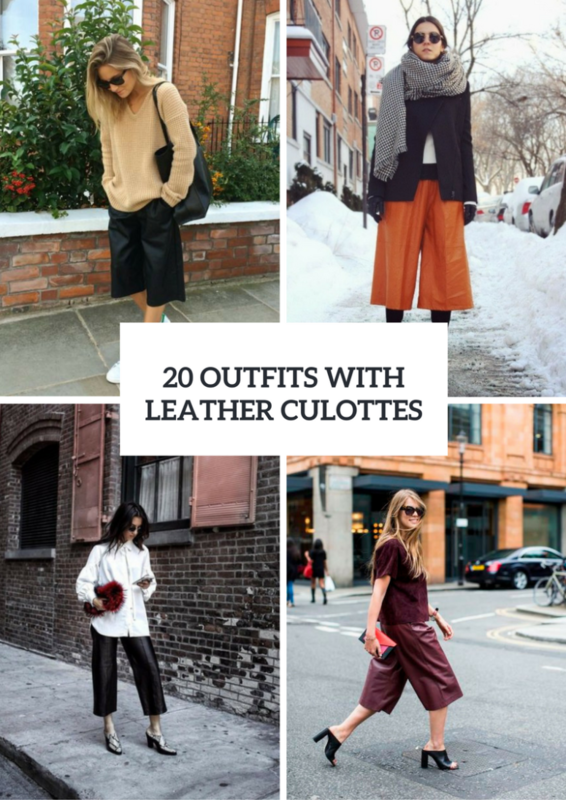 And today I’d like to represent to you some stylish and chic looks with leather culottes. At first, you need to consider all colors and choose one, for example, it can common black, eye-catching orange or gorgeous purple. Then start to create comfy and elegant outfits, you can experiment with various fabric textures, for example, mixing leather pants with a denim shirt or a suede jacket. Wanna find more ideas? Then scroll down to see all of them. Get inspired! Don’t be afraid of oversized pieces of clothes, so you can pair black leather culottes with an orange oversized sweater, red pumps and a red leather bag with tassels. Or you can combine a loose denim button down shirt with culottes, a black jacket and black cutout boots. Of course, culottes look better with heels, but if you want to create a sporty or casual outfits, then you can take sneakers or slip on shoes and mix them with a camel loose sweater, leather culottes and a black tote. 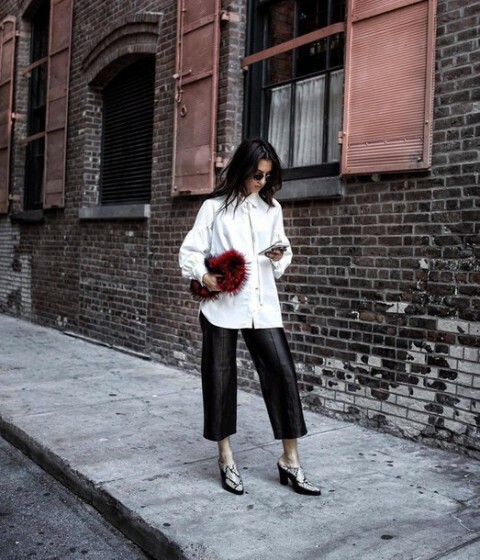 If you like neutral colors, then you can pick up brown high-waisted culottes and combine them with a white sweater, gray ankle boots and a beige leather bag. You can also add a gray mini coat to this outfit. One more gorgeous color for culottes is marsala one. Just pair a marsala shirt with marsala culottes, black cutout boots and a geometric printed clutch or combine a striped sweater with pants, printed leather boots and a red clutch, and voila — awesome outfits for every day are ready!